The Home & Garden Expo begins in just hours – are you ready? 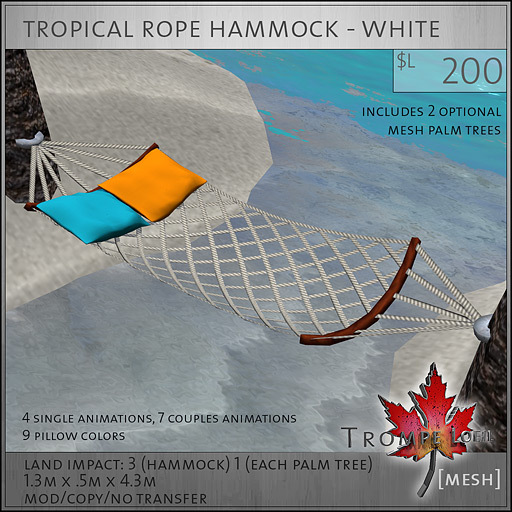 Trompe Loeil will be releasing new exclusive products all week in celebration, and here’s our first batch! 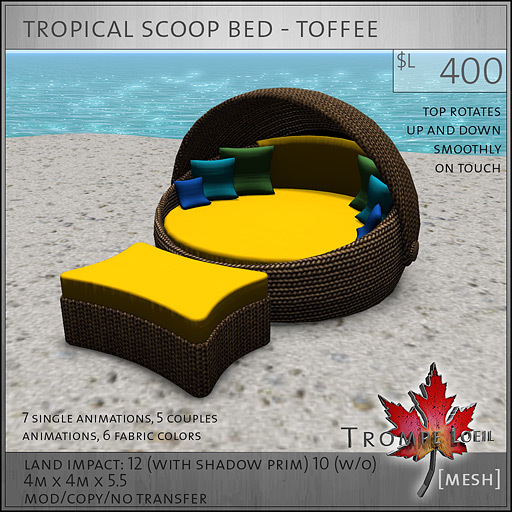 Our Tropical Scoop Bed is perfect for the deck, beach or bedroom, available in three wicker colors and all scripted with 7 single animations, 5 couples animations, and 6 fabric color choices for the ottoman, bed, and pillows. Mix and match and make your own tropical style! Plus, the sunshade moves smoothly up and down at a touch – great for photos with shadows enabled! 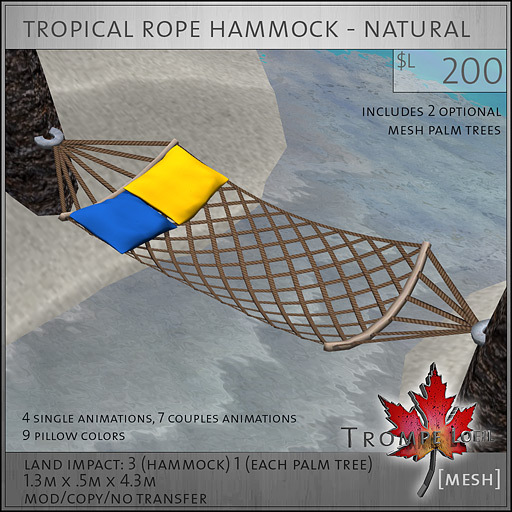 Our new Tropical Rope Hammock is a lightweight – only 3 prims! – and fun addition to your outdoor summer decor. 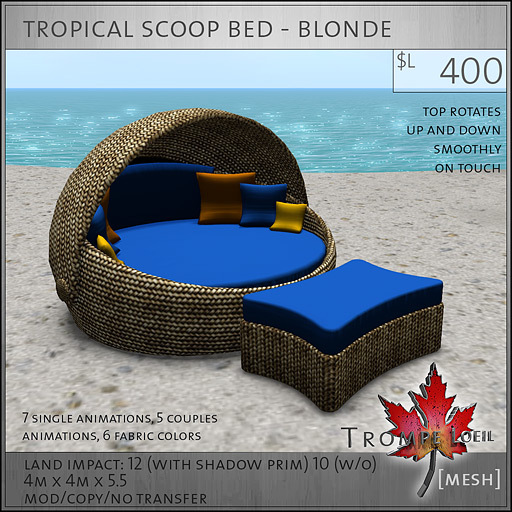 Includes 4 single animations, 7 couples animations, and 9 pillow color/texture options! Plus, we’ve thrown in 2 palm trees to give you a place to put it! 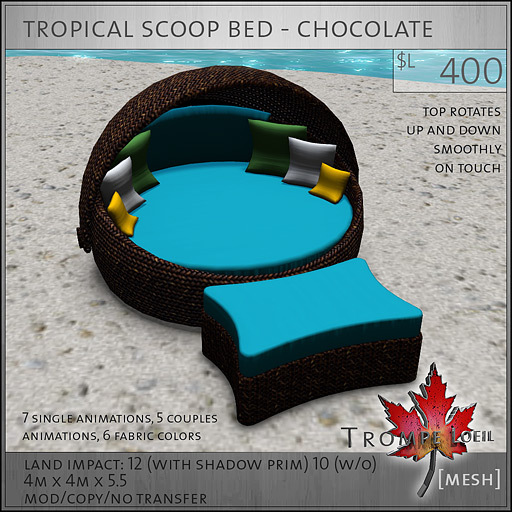 These new exclusives are available at our Home & Garden Expo location on Dreamseeker Expo 4, along with our brand new and exclusive Tropical Beachfront Bed and Mesh Palm Tree Megapack, both donations to the RFL cause all week. We’ll be releasing new exclusives all week, so stay tuned!